Here is the new Mariah Carey music video directed by her husband Nick Cannon. Watch Mariah writhing around as a Vegas showgirl while wearing short shorts and playing with her hot male model boyfriend. Mariah's hubby Nick Cannon said it was hard for him to direct his wife in bed with another man. Rapper/actor NICK CANNON struggled to direct his wife MARIAH CAREY's new video because she had to roll around in bed with another man. Cannon admits he had no idea how hard it would be to watch his partner pretend to make love with a model right in front of him, while they were making the promo for I stay In Love together. He says, "We did it in, like, one take and I had to kick the dude out. It was one of those situations where I wasn't intimidated but I could've knocked him out at any point. Mariah Carey has been announced as one of the performers performing at Fashion Rocks in New York on Sept 5th. Beyonce, RIhanna,Justin Timberlake and Fergie are also performing at the Radio City Music Hall concert. Mariah made a promo stop at MTV TRL yesterday. We can't help but notice that Mimi's skirts keep getting shorter and her mid drift gets higher as she gets older. We're not hating on Mariah because she has a great bod and killer legs. We just wouldn't be surprised if she's wearing similar outfits when she is sixty. Mariah Carey, Justin Timberlake, Beyonce and Rihanna will perform at the fifth annual Fashion Rocks concert celebrating the relationship between music and fashion. The event will be held Sept. 5 at Radio City Music Hall, and will air in a two-hour special on CBS the following night. Proceeds will benefit Stand Up to Cancer, a program established by the Entertainment Industry Foundation to raise money for cancer research. Also performing: Keith Urban, Chris Brown, Kid Rock, Fergie, Lil Wayne and the Black Eyed Peas. Mariah Carey is back with another hot single with T.I. Mariah looks more beautiful than ever in this I'll be Lovin U Long Time Video. Work that bikini girl. Tags: e=mc2, mariah carey, music video, nick cannon, t.i. Mariah Carey and Nick Cannon have canceled their unncessary sequel wedding because no one wanted to look at any more pictures of the couple. Mariah and Nick who were already married in a secret wedding wanted to get more money for their photo op love and when no one wanted to pay up they backed out of the wedding. Mariah and Nick are already married so why do they need to get married again? The couple already posed for their People Magazine wedding photoshoot and everybody has heard everything about the wedding in Mariah Carey's interview on Ellen. We also are wondering why they canceled their wedding if money isn't the only reason why they are both together. If you're in love and you want to get married again then you can get married. You don't need to get paid millions of dollars to do it. We don't think these two are going to last much longer if they can't get money out of their relationship. There is some good news for all of Mariah's rich friends she tried to hit up for expensive wedding gifts at Bergdof Goodman's. Now they don't have to buy any wedding gifts for the multi million dollar diva who can already buy anything she wants in the world. The Mariah Carey wedding registry maneuver was pretty tacky. Mariah and Nick Cannon's photo op love is so obvious that the UK Daily Mail has crowned them "America's most cringe worthy couple." Pop singer Mariah Carey, who secretly got married to rapper and actor Nick Cannon, has canceled a second wedding ceremony she wanted to organize for her friends here. Carey and her husband reportedly wanted to spend millions of dollars on the ceremony and make up for it by selling pictures to magazines but no publication was interested. The MTV Japan Awards 2008 were held this week in Japan. 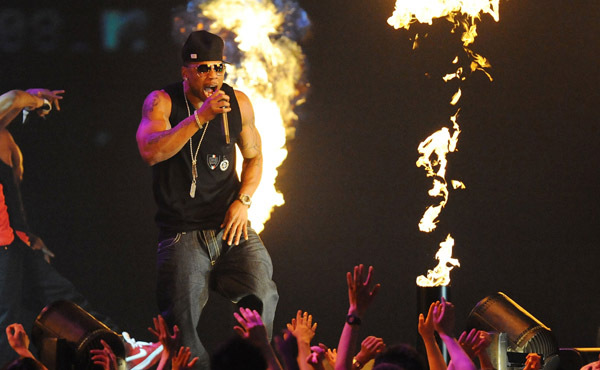 Nelly and Fergie performed and some of the big winners were Ne-Yo and Mariah Carey. Ne-Yo won for Best Male Video and Mariah Carey won a special Video Vanguard Award. Click here for the complete list of winners. Mariah Carey and her new hubby Nick Cannon spread their PDA love to Asia. Earlier in the week the affectionate couple arrived in Tokyo Japan. Mariah Carey threw the first pitch at a baseball game. Let's just say that things didn't go too well. The clip is in Japanese but we don't need to translate the video for everyone to see that Mimi can't throw a baseball. Hilarious...we couldn't help but laugh. Isn't seeing Mariah Carey trying to throw a baseball in high heels deliciously crazy? That is one of the reasons why we love Mimi so much. She really handles that bad throw with style. Just when you thought there couldn't be anymore goo goo eyed love faces from this couple they announced that they're doing the whole wedding thing again. Check out Mariah Carey sitting on Nick Cannon's lap. Is it just us but doesn't it look like Mariah was about to hug the baseball player at the 0:53 second mark? Mariah and Nick definitely went Hollywood on this whole multiple weddings situation. Nick Cannon is an actor and everybody loves an unnecessary sequel. Plans for Mariah Carey’s second wedding to husband Nick Cannon are well underway, and this time around, Carey plans to make her nuptials an over-the-top event, according to a source close to the singer. “It’s going to be held in New York City in the next six weeks. Picture a wedding on the scale of Liza Minnelli’s (to David Gest) and you’ll be on the right track,” said the source. MARIAH CAREY TREATS HUBBY NICK CANNON LIKE HE'S HER ASSISTANT? There are rumors that Mariah Carey is treating her new hubby Nick Cannon like one of the assistants in her entourage. Nick had better be careful or he could become Mimi's new drink holder. 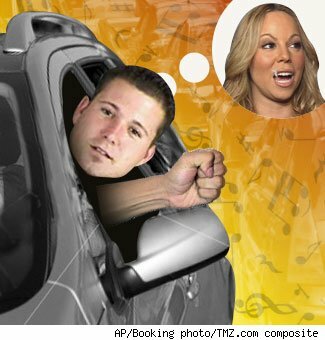 Did you know that listening to Mariah Carey could cause road rage? 21-year-old Zachary Alan Schreiber of North Naples, Fl. was arrested on Saturday night after allegedly throwing a beer bottle at someone who went off because he was blasting Mariah Carey music. Our guess is Zach was probably singing along to "Touch My Body" and doing those famous Mariah Carey hand gestures. Why does he have the empty beer bottle handy in the car anyway? Did he drink the beer from the bottle while driving and then hurl it? You see how dangerous it is to drive while singing along to Mariah Carey? A man blaring a Mariah Carey song from his car stereo was arrested Saturday night after throwing a bottle at someone who didn't share his taste in music, according to deputies. Zachary Alan Schreiber, 21, of 5750 Painted Leaf Lane in Golden Gate, was stopped at the light at Pine Ridge and Airport-Pulling roads around 10:30 p.m.
His music drew the attention of Mariah-hater William Greenman, 22, who called Schreiber a derogatory name for listening to the newlywed singer's music. Profanities flew back and forth between Schreiber and Greenman, who was a passenger in the other vehicle, as the cars traveled west on Pine Ridge, deputies say. When they again stopped at the Goodlette-Frank intersection, the war of words escalated. Deputies say the avid Mariah fan then hurled a beer bottle at Greenman. Greenman ducked, but deputies say the bottle hit the car's driver, 21-year-old Christine Bec, in the side of the head. Schreiber is charged with shooting a missile into a vehicle and criminal mischief. We've heard of public displays of affection but newlyweds Mariah Carey and Nick Cannon are taking PDA's to a whole new level. The newlyweds celebrated their wedding reception at Six Flags Magic Mountain. Check out the details. Mariah and Nick Cannon's photo op love is so obvious that the UK Daily Mail has crowned them "America's most cringe worthy couple." Do you see Mariah Carey rocking the superhero cape? Nick we just wanted to let you know that you shouldn't let Mariah walk around dressed like a superhero. We love Mariah Carey. But the sight of a woman who is almost 40 years old walking around an amusement park wearing a pink supergirl cape is just plain CRAZY! Remember when poor Mariah Carey had a nervous breakdown and went crazy on national tv? Mariah freaked out in 2001 on TRL and had to check into a mental facility a few days later to get help. Click here to watch the episode. Mad TV did a spoof of the Mariah Carey breakdown episode. Wait until Ashley Simpson and Pete Wentz get married. Watch Mimi talk about her new hubby Nick Cannon during her nterview on Ellen. At first they were desperate to keep their romance top secret, but now newlyweds Mariah Carey and Nick Cannon want everyone to know they're in love. The giddy newlyweds could barely keep their hands and eyes off each other in a rather nausea-inducing show of affection at Magic Mountain fun park in California on Wednesday. And the pair were again spotted pawing all over one another at a charity gala for Operation Smile in New York last night. The 38-year-old singer wed rapper and actor Nick Cannon, 27, at her private estate in the Bahamas on April 30th after a whirlwind six week romance.